“Details are the difference between good and great.” This is the concept followed by owners Janie and Ryan Rogers and Brandon Juon, three life-long residents of Council Bluffs, Iowa who operate 712 Eat + Drink. The restaurant is named for the local area code. Located just across the Missouri River from Omaha, Nebraska, this neighborhood bistro combines made from scratch recipes, locally grown produce, and natural, locally sourced proteins with a clean, casual, contemporary atmosphere. Menu: Executive Chef Oscar Hernandez takes midwestern comfort food and raises it to a new level. The fried pickles are homemade and served with herbed crème fraiche. Tater tots are more often served at home than in restaurants, but when they are smothered with braised pork belly, fontina cheese, and ancho chili mayo, the get to go out to be eaten. The Oink Mac & Cheese (pork belly gives it the oink) and the Short Rib Mac & Cheese dress up an American favorite. Salads please the traditional palate with a Wedge or Caesar, but the trendy diners will be thrilled with a Beet or Kale salad. Chicken, shrimp, steak or salmon can be added to any salad to turn it into a full meal. The Pork Shank and Short Rib are slow-cooked to tender perfection. The meat inside the lasagna is Kobe beef, and the Plum Creek roasted chicken gives credit to its local heritage. A large selection of craft beer is available, but it was the prosecco on tap that caught my attention. Whether you want to drink big and eat small, drink small and eat big, share small plates or not share your amazing entrée, the staff is willing and able to cater to your desires. 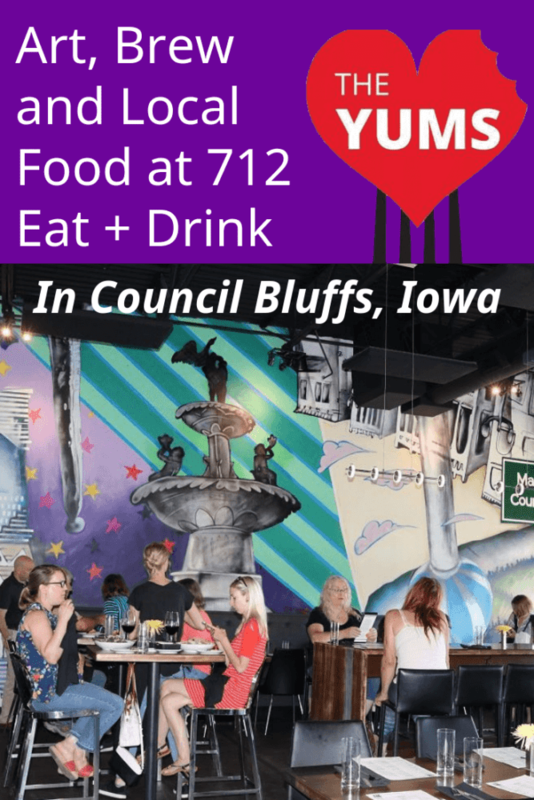 Thoughts: I dined at 712 on my first night in Council Bluffs, and only my second trip through Iowa. Not only was the food special, but the 44-foot mural painted by artist Gerard Pefung on the wall was a great focal piece and conversation starter about all things Council Bluffs. From Lewis & Clark to Grenville Dodge and the Union Pacific Railroad, to the farmlands that feed the world, Pefung’s work pays tribute to significant events in American history that aren’t often celebrated outside of this region. The locals are proud of their history and proud of their food. I am glad I had the opportunity to share in the bounty. Price Range: Starters $6-15. Handhelds $10.50-12.50. Greens $7-10. Sides $2.50-6.50. Entrees $19-32. Sweets $6-8. Disclosure: The writer was hosted by Tourism Iowa and the Council Bluffs Convention and Visitor’s Bureau. Victoria Hart loves to share her travel tips, bargains, strategies and stories, inspiring others to create their own adventures. She is the founder and Chief Adventure Officer at JourneysJauntsandJunkets.com. When Victoria unpacks her suitcase, she calls Powell, Ohio home.She holds a B.S. in Communications from Miami University in Oxford, Ohio. Follow her on Facebook at JourneysJauntsandJunkets.com, on Twitter @JourneysJaunts and on Instagram at journeysjauntsandjunkets.